The word is out this afternoon that just days after the Nationals parted ways with first baseman Adam Dunn, the team has come to terms with former Philadelphia outfielder Jayson Werth. The team is expected to announce the deal in a 5pm press conference. While the details of the contract have yet to come to light, beyond it being a 7-year deal, this a huge bombshell to start off the Winter Meetings in Orlando. To give you Werth’s details at Nats Park, in 2010, Werth hit .419 at Nats Park, and slugged .806 for a monstrous OPS of 1.306, the best of any ballpark not named Coors Field. Now, granted, some of that has to be given to our terrible pitching, but it’s still impressive to see someone take to a place like that. Asking around this morning, everyone I talked with seemed to like Jayson, and one of my fellow fans went as far as to say that if you don’t like Jayson Werth, chances are you probably just don’t like people. Looks like Ryan Zimmerman has an upgrade behind him in the lineup! Update: According to sources, the deal is worth $126M over 7 years, or approximately, the gross domestic product of Kiribati. Good signing, even though the contract’s probably 3 or 4 years too long. Werth is streaky as hell — he’ll go through periods where no one can get him out followed by bouts as a strikeout machine. But he’ll always give his best effort, and he’s a damn good right fielder who can play center. As a long-time Phillies fan, I’ll never boo Jayson Werth, who was a big part of the team’s recent success. Good luck in DC! Dunn’s WAR (Wins Over Replacement) last three seasons. The main difference is Werth’s speed and defense and Dunn’s lack of it. 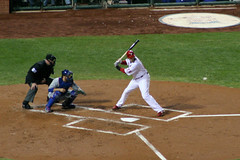 Dunn hit some great no-doubt moon shots, but Werth is a better player. 7 years and $126M? They should have reduced the years and given Dunn the extra time and money he wanted. I’m not exactly angry over this, because Werth does look good, but I would have prefered to keep Dunn to everything else. You make a good point Brian, but those WAR stats speak for themselves. Dunn’s poor defense cost runs (Thus he will DH for the ChiSox). Werth is good all around. If the Nats reduced the years, they probably would not have been able to sign him. But I agree 7 years is too many. However, the Werth signing does send a signal to the fans and Ryan Zimmerman now has more protection that POTUS.